It’s time to come to terms with the fact that three-prong wall outlets are a relic of the past. Sure you still need them in your kitchen for your appliances, and you also need them near your TVs and whatnot. But all of your gadgets and gizmos use USB cables that get plugged into wall outlet adapters. It’s time to embrace the future and cut out the middle man with Quick Charge 2.0 Type C Dual USB Wall Outlets by TOPGREENER. 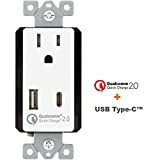 They’re easy to install, they’re affordable, and they charge even faster than normal USB outlets thanks to QC2.0 technology. There’s also a version with two regular USB ports instead of one USB-C port and one standard port.